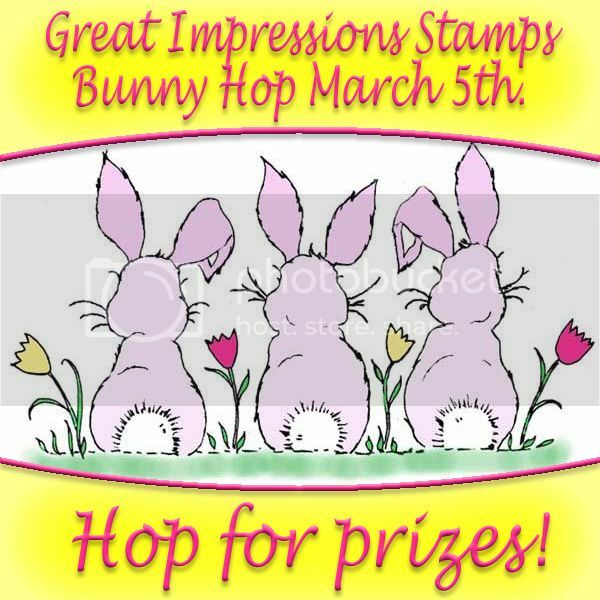 Welcome to the Great Impressions Stamps Bunny Hop! Today we are celebrating all things spring! If you hopped here from Angi’s blog, you are in the right place. If you are just joining in the fun, you might want to start at the beginning (Angi’s blog) so that you do not miss out on any of the beautiful projects from the Great Impressions Stamps design team. Don’t forget to leave a comment at every stop on the hop for your chance to win some fabulous stamping prizes. For my card, I used the beautiful image Spring Boots (E642) and some pretty papers from My Mind’s Eye. I created this card as a birthday card for a friend. With all the cold and snow we have had lately, I know that we both can’t wait until spring comes and our grass is green like this again. Your next stop on the hop is the talented ERIN. Don’t forget to leave a comment at each stop in the hop to qualify for some fabulous stamping prizes. Cheryl <== You are here! Thank you for hopping by! Have a great day! Love the boots - and loving Great Impressions stamps - they are so versatile. Great job. I love the colors of your card ;) the stamped image just spells spring ! Wow cute one Cheryl. Love the bright colors used. The boots image looks awesome n the coloring looks too good. Oh my gosh!! Another stamp to add to my list! I love those yellow boots and your coloring is divine! Cheryl - Your card is adorable! Love your bright cheery colors not the kind of day we are having though. Gorgeous card, Cheryl, beautifully colored as always! Adorable spring card. And love the boots image. Lovin' these boots! Your card is wonderful, Cheryl, and I had to peek at the cuteness of your Whimsy card too! Love them both - thanks for sharing :) Enjoyed being teamies with you for a couple of months! you really do bring these images to life... this is so cute and i love that little birdie on the boots...so fun.. So cute. i love the colors you used! Your coloring of this great stamp is so good! Very pretty card. Very cute--love the yellow boots and the lace/twine/button. Oh how I wish for speing. This makes me lobg to be in the garden again! I love the boot stamp and the lattice work. Gorgeous! You color so well! I am enjoying this bunny hop so far! love the rustic wood background with the pretty lace!! Cheryl, oh, this makes me ready for spring, seeing the robin perched on the boots. Love the vivid colors. Thanks for sharing. Your card is so Beautiful. I love every last detail down to the stitching...Wonderful card. Very sweet image. I love the gorgeous mat and the crochet trim. What a cute card. I love the rainboots! Cheryl, your card is stunning! I am adding the Spring Boots stamp set to my wish list... and you did a fab job coloring! Your card is wonderful. The coloring of the image is fantastic. And I like your overall color combination, esp the yellow lace. Love the bright colors you used. Stunning card! Thanks for sharing. The more I see this stamp the more I think that I gotta have it. Cute card. Cheryl you have me dreaming of spring with your last few cards. Love the way you highlighted the boots with the fabulous coloring, layouts, paper and your wonderful stitching. Another eye popping card. Thank you so much for sharing your wonderful creation with us at 4 Crafty Chicks. I love the little birdie on the boots! Very cute! What a fabulous card.. Beautiful Spring colors and great coloring of this adorable image. those boots are adoable!!! love this card! Wow! This is so beautiful! Love the wood grain background, and those colors work so nicely together! Oops almost forgot that yellow lace--swoon! A warm and lovely design, Cheryl. Thanks for playing at Avadares Challenge Blog. This is really a fabulous card and I love the colors and the image is absolutely lovely! Thank you for playing our stitching challenge at 4 Crafty Chicks! April showers mean boots and May flowers! I've seen the boots before...I love them then and still love them now...you have wowed me with your card! oh goodness...your image is colored so richly...love how vibrant you have made you image and showered with a pretty layout as well! I love your colors- and have to say I love the gathered lace- Great card! Sweet card! Love all your layering! What a beautiful card and really love the boots!! This image and card are lovely, it makes me wish for spring even more now! cheryl, this card is amazing! Love the image you chose and the outdoor feel of the card, so Spring like! Thanks for joining our Anything Goes Challenge at Paper Playtime! Hello again Cheryl, back with another DT. I just love this card, so pretty! Thanks for joining our Anything Goes Challenge at One Crazy Stamper! Good Luck. I LOVE this card! GREAT colors, all around, and the image looks amazing! You rocked it! Thanks so much for joining us over at the Simon Says Stamp Challenge Blog! This is such a sweet springtime card! Love the yellow and browns. I just want to touch that crocheted lace - beautiful texture & card, Cheryl! The boots are adorable - and the colors really great! I could see myself using the spring boots stamp. Thanks for sharing! I love those boots! Sooo cute! Very pretty Cheryl! Looks like I'll be wearing these boots tomorrow for sure!!! Great image and beautifully colored! Love your choice of papers, die cut and the overall design of the card. Thanks for sharing with us and playing in our neighborhood at 613 Avenue Create! Love this darling card, Cheryl!!! What a gorgeous spring card, Cheryl! I love all the layers of pretty papers and the lattice framework for that adorable image. Fabulous coloring job. Really love the twine tie and the ruffled lace, too. This is uh-dorable! I love the color scheme for this card. This is so beautiful. The image is gorgeous!! Thank you for joining us at Paper Playtime!! Pumpkin Spice–What Time Is It? I am a 40-something year old working mom. I live in Wisconsin with my husband, daughter, a dog, and a parrot. During the day I work with numbers and spread sheets so in the evenings I enjoy a chance to play with paper and be creative. I am hopelessly addicted to designer papers, Copic markers, buttons and baker's twine. I love to use these items along lots of layers and stitching when creating my projects. You might know me as elizgmom on Splitcoast and other networks. Besides paper crafts, I love reading, listening to music, and having fun with my family. Thank you for stopping by!